St. Andrew is named for the disciple Andrew, who was a fisherman by trade. 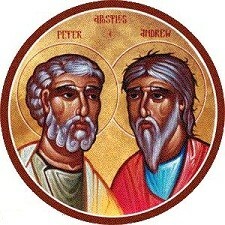 Andrew was the first disciple drawn to Christ, and who brought Peter and others into contact with Jesus. Jesus said to them, "Follow me, and I will make you fish for people" (Matthew 4:19). This is still our mission today. The people of St. Andrew United Methodist Church have been called by God to EMBRACE, EQUIP and ENCOURAGE persons of all ages to live as faithful disciples of Jesus Christ.